Northside College Prep is the top-ranked high school in Illinois and 40th in the nation, according to U.S. News & World Report. CHICAGO — Chicago high schools scored big in this year's U.S. News & World Report list of top schools in the state. 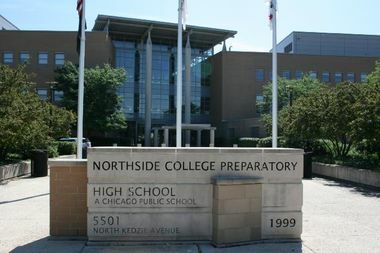 Seven Chicago schools made the Top 10 this year, with Northside College Preparatory High School again coming in at No. 1. Mayor Rahm Emanuel said the accolade proved that Chicago schools were among the best in the nation — and used the opportunity to criticize Gov. Bruce Rauner for the financial crisis engulfing the school district. "Despite a discriminatory state funding formula that treats Chicago students as second-class citizens, and a governor who has not introduced a balanced budget in over two years while wreaking havoc on education funding from Pre-K to college, Chicago schools and students continue to beat the odds and break new records every year. CPS students, teachers, principals and families deserve tremendous credit for their hard work, talent and unwavering commitment to academic success,” Emanuel said in a statement. A spokeswoman for the governor declined to comment on the mayor's statement. U.S. News & World Report evaluated more than 22,000 high schools in the United States. Criteria included the number of students taking and passing advanced placement classes and whether a school's minority and low-income students performed better than the state average for their peers. Click here for the national list.